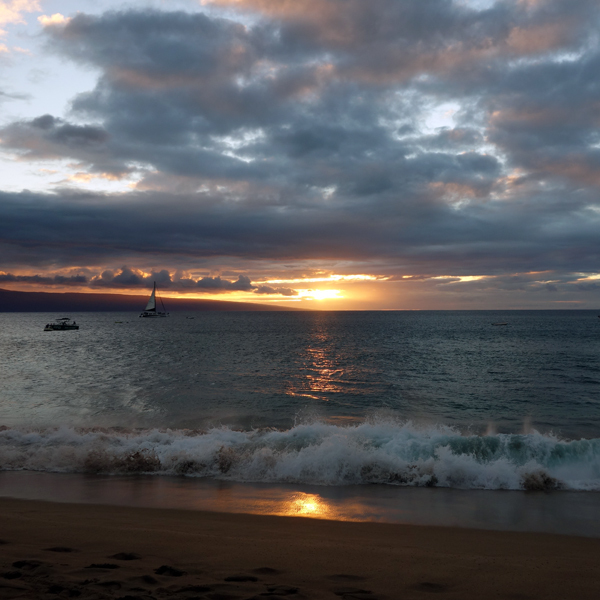 I love Hawaii: beautiful nature, relaxed atmosphere and great food. And for what I value in that type of vacation the most, the best time for visiting Hawaii is late September – early October: ocean is the warmest possible while the air and sun is already tolerable at least part of the day; many tropical fruit and vegetables are the best in that season; sunsets are around dinner time; and it is slightly less crowded since school has just started. It’s mid-September already, and I long for that leisure week of swimming, stargazing and eating tropical fruit and fish. Sadly, this year we didn’t get to go to a tropical vacation. European trip, especially its London part, was great but I miss Hawaii. So to cope with that I’ve been recently wearing Ginger Ciao by Yosh. Made for warm summer nights, it exudes a tropical vibe that is at once relaxing and exciting. Birgit has always had huge influence on me, so from that moment Ginger Ciao got its tropical designation and became my number two* Hawaiian vacation perfume. It accompanied me to several trips, and I discovered that it was equally beautiful in the breezy warmth of tropical night and in sunlit heat of lazy Hawaiian day. Ginger Ciao notes include coconut, night blooming cereus, tiger lily, neroli, ylang ylang, ginger, basil and sandalwood. Coconut is not too sweet, sandalwood is creamy, and all the floral notes sing nicely together with neither of them doing solo. It is one of those perfumes that seems simpler when you think about it remembering than it proves to be when you wear it. Recently I got a bit of a scare: there was a huge sale on Yosh perfumes at Hautelook. Combined with brand’s site being down and no new releases in a while, I feared the worst. So without thinking for too long I’ve bought a back-up bottle. Since then I calmed down and did some research. It seems that many of the online retailers still stock Yosh perfumes, full priced. Yosh Han, the brand’s owner and perfumer, is still active in perfume industry: according to her FB posts, she’s just worked at Pitti Fragranze with INEKE. So who knows: maybe one day soon Yosh releases a new chapter in her brand’s story. But meanwhile I’m happy that I’ve got an extra bottle of perfume that I love. And I’m glad to report that perfume from the new bottle smells identical to what is left in my 6 years old bottle. So, for the next 6 years I’m covered for my future trips to Hawaii (I hope) or for surviving a lack thereof. Have you tried Ginger Ciao? Do you have any perfumes that you associate with beach vacation? * Estee Lauder Bronze Goddess is my #1 tropical vacation perfume. 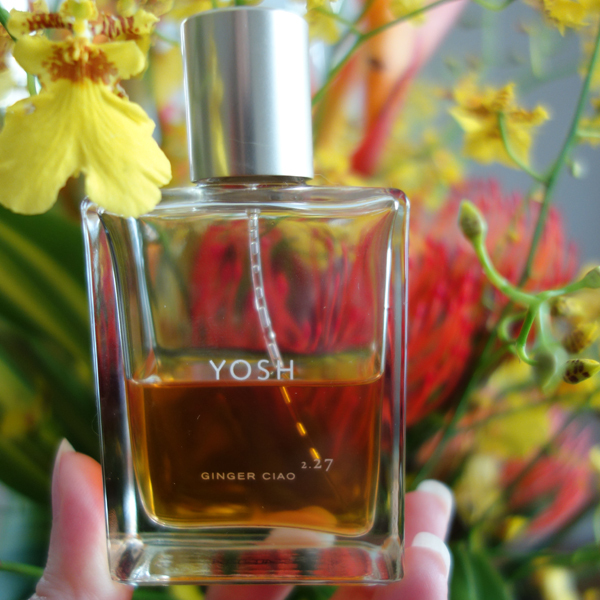 This entry was posted in "Four legs good", Attempt at a Review, Favorite Perfumes and tagged Ginger Ciao, Yosh, Yosh Han. Bookmark the permalink. It’s so good to hear of a perfume that hasn’t been altered; reformulation is the bane of my life, and in particular the dilution of fragrances, even within the first year or two of their launch! I must now seek out Yosh, especially Ginger Ciao – I used to like Origins’ Ginger Essence and Ciao sounds like it has a welcome added dimension. I didn’t see Yosh at any of the U.K. perfume boutiques. FiF carries the line (and sells samples) but their shipping costs to the U.K. are brutal. I hope you’ll get to test it one day. I too saw that amazing haute look sale and wondered if they were discontinuing GC…you have made it sound very tempting! I hope it is not going away yet: I still might want to look (smell) closer to several other perfumes in the line. – tropical and vacation-y – while its base accord smells so rich and creamy. Gorgeous stuff! Rusty was probably just imagining that he was on a tropical beach laying relaxed waiting for a piece of mango (or a treat at least). Now that you mentioned it I started wondering if it was actually expensive for a person living in US to go to Hawaii? For someone like me in Europe it would be a huge trip, just like going to Barcelona or London was for you earlier this year. I remember I tried Ginger Ciao but I don’t remember how it smells, which probably means it wasn’t attractive enough to my nose to remember it. Nevertheless I’m happy you could get a backup of a perfume you love at a special price, and even more that its formula is still the same. So I’ve heard that Yosh was in Florence during Pitti but I didn’t meet her in person. I got to talk to Ineke though. The expense of going to Hawaii depends a little on where you are . My west coast friends see it as no big deal – shorter flight, etc. I’m in Pennsylvania and it was a major trip for us, both in time and flight expense. I’ll second MMKinPA’s explanation about the flight: from where I live it’s a 5.5 hours direct flight. From many places in the U.S. it’s twice longer. Also, it depends on where you stay: there are very budget accommodations as well as extremely luxurious – and everything in between. In general, it is rather expensive, especially for families with kids. But it is rather mass-market then exclusive type of vacation. The next time you have a chance (or when we make that chance ;) ), you should try Ginger Ciao again. Wow! you really made a dent in that bottle! Based on your description this sounds like a fragrance I might like. I don’t really have any fragrances that I associate with vacations as it has been a very long time since I took a proper vacation. But citrus scents do make me think of summer! I haven’t tried this or any perfume from the brand but happy for you and others that they are still available. I wanted to associate my decant of Songes (which Vanessa kindly sent me) with my last holiday but didn’t end up wearing perfume, just the scented Nuxe body oil. That always smells like beaches to me. 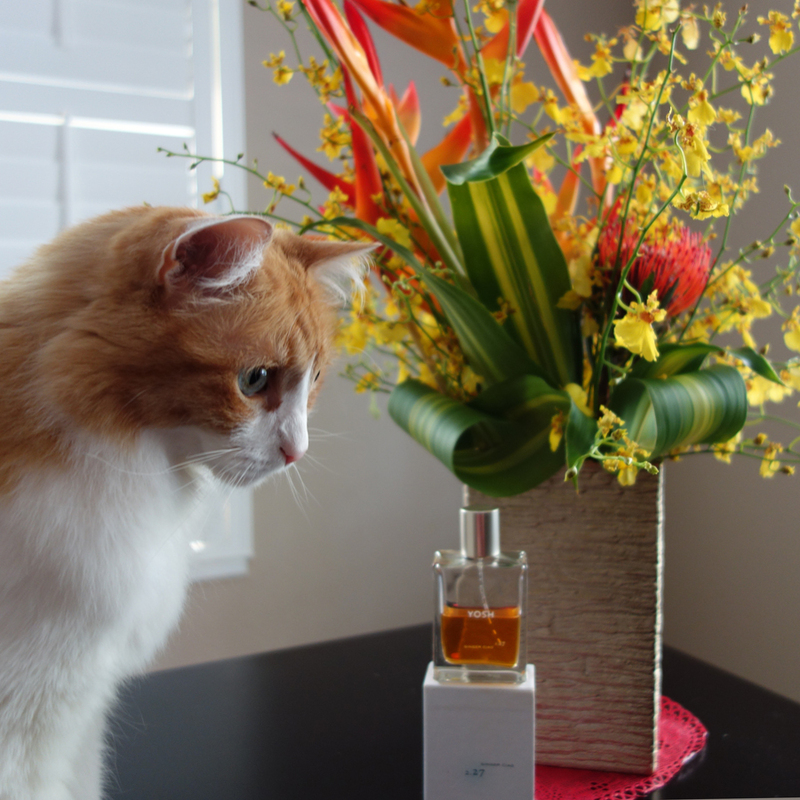 Great pic of Rusty staring right at the perfume bottle! I’m sure you’ll get a chance to try Ginger Ciao. Ginger Ciao is one of my favorites, and I picked up a bottle a few years ago after having run through several samples. What a wonderful perfume to wear in Hawaii! I also finished a sample or two before going for a bottle. And I’m sure that it won’t be hard to finish this bottle now when I have a back-up bottle. 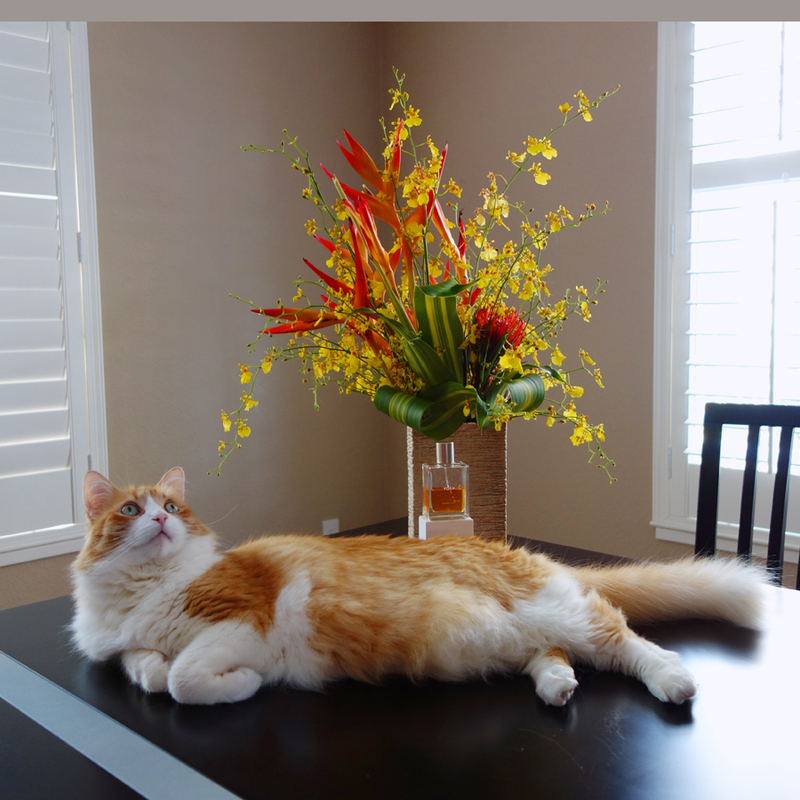 That Rusty – such a poseur! I am pretty sure I’ve tried this before and have a decant somewhere in the decant sea. Like Lucas, I don’t recall what it smelled like. If it smelled terrible, I would have filed that away and remembered, so there’s hope! I have never been to Hawaii. I have 2 cousins who live there with their spouse. I have an open invitation to stay at one of their homes. Also, one of them had an amicable divorce from someone whose family owns a bed and breakfast and I have an open invitation to stay there as well. Yep, you should have a decant of it. I hope you’ll find it. I will be really surprised if you dislike it but there’s a small chance you’ll like it less then I do. But you have to try it! Ooh, Rusty is doing that bent back paw thing that Truffle does every time she lies down! I think I have tried and liked Ginger Ciao, but have no sample at the moment to retest it. I should do with those notes! Glad you got a back up bottle and that it is the real deal still. I don’t have beachy holidays but if I did I would associate them with Songes, Bronze Goddess, PG Long Courrier and Heeley Coco Bello. Next week we’ll have another bout of summer so I’ll wear Sognes to see how it fares in heat. I’m not familiar with the other two. This sounds like a very good substitute for a Hawaii vacation. And Rusty definitely approves! Rusty definitely approves us not going anywhere. Bronze Goddess is unique: for the brand and the price it has unexpected number of fans among perfumistas.